Ok so I'm gonna do something a little different and review both versions of this show together. The Australian version being the original version that inspired the American adaptation. 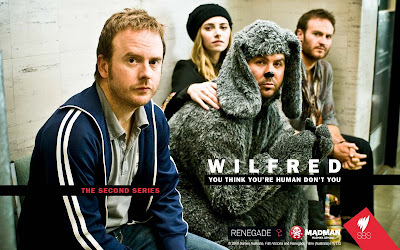 Adapted from the award winning short film in 2002, as per the poster above, yes, it's a guy in a dog suit... but in this reality, only the main character (the boofhead in the foreground) can see him as a grown man but everyone else just sees cute little Wilfred, the dog. There's really not too much else to explain about this show I guess. It's a comedy where Wilfred, part dog, part Russel Crowe on a bender, drinks and smokes and roots teddy bears all the while exploring what a part man/part dog character can do. Yes, I realise I really haven't explained anything there. Anyway, the Australian version is pretty good. An entertaining watch but even before the U.S. version came along I couldn't help but think that it wasn't hitting it's full potential of what you could do with a character like Wilfred. I was kind of just going through the motions with season 2. It got a bit old. When I heard the Yanks were giving this show a go I though it would be a disaster like the Kath & Kim remake but Jason Gann, the creator, writer and guy who plays Wilfred, signed on to continue in the same role for the U.S. version. Genius. Bloody genius. The U.S. version is everything I wanted the Australian version to be. Frodo, er, I mean Elijah Wood plays a solid part in this and to my surprise, not for a second do I picture him as the hobbit anymore so that's a good sign. With continued creative input from Gann, the money of American network FX, direction by Randall Einhorn (The Office U.S, It's Always Sunny In Philadelphia) and writers with credits on Scrubs, Family Guy and Frasier, this show is exactly how you'd picture a comedy about a half dog/half man... and it's brilliant at times. I can't wait for season two. and check out this anti-smoking spoof as part of the Wilfred promos in the U.S. I have to agree with you, the US version is exactly what the vet ordered. Although I still see Elijah Wood as a insecure shoeless little man, now he is humorous, so I feel its OK to laugh at him. Working at DISH Thursday was my last night of the week, and for that 13 weeks there was nothing better then sitting down after work at midnight to watch Wilfred, although I have yet to figure anything out from the final episode, I figure my questions will hopefully be answered in season 2. It is nice though to go on to DISH online and watch any of the episode from the first season, but even after watching episode 13 3 times, I still am left with gnawing questions that just get worse the more I watch.